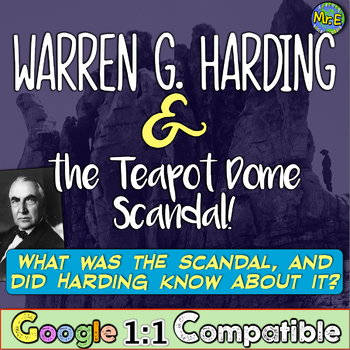 Warren G. Harding the Teapot Dome Scandal: Did Harding Know Before His Death? 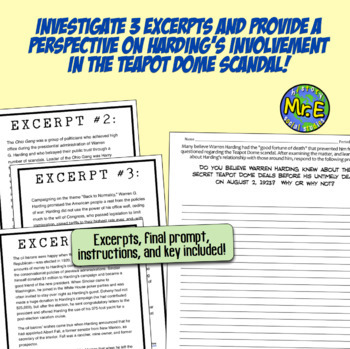 In this engaging and hands-on resource, students learn about the Teapot Dome Scandal that took place under Warren G. Harding's presidency in 1923, one of the largest political scandals in American History. Three assignments are included in this resource. First, a background reading is included to provide background knowledge on the state of the country, the Election of 1920 and the "return to normalcy" promised by the Republican-led Harding campaign, the appointment of Albert Fall to the Secretary of the Interior, Executive Order 3474 that moved control over the Teapot Dome oil field, and the death of Harding (while on his "Voyage of Understanding") as the investigation uncovered corruption within his cabinet. 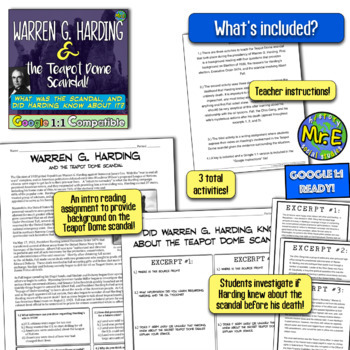 Second, students complete a short excerpt analysis where they investigate three pieces of information related to the Teapot Dome Scandal, the Ohio Gang, the relationship between Warren Harding, oil tycoons, and his cabinet members, and the mysterious actions of Florence Harding (Warren's wife). Finally, students complete a short prompt where they lay out their evidence whether they believe Harding knew about the scandal before the "good fortune of death" saved him from impeachment. 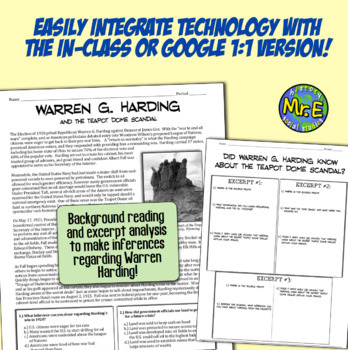 A teacher key and full Google 1:1 version are included!